Minotaurs are powerful and monstrous humanoids that are half taurine, half-human. They are mainly larger than most humanoids, either in height or sheer mass. Jashnian and similar minotaurs are found to be the purest of bloodlines, mostly due to the Minoans of Zendelon. More details about the Jashnian (WFR) minotaur lands and cultures can be found on Minotaur Races. 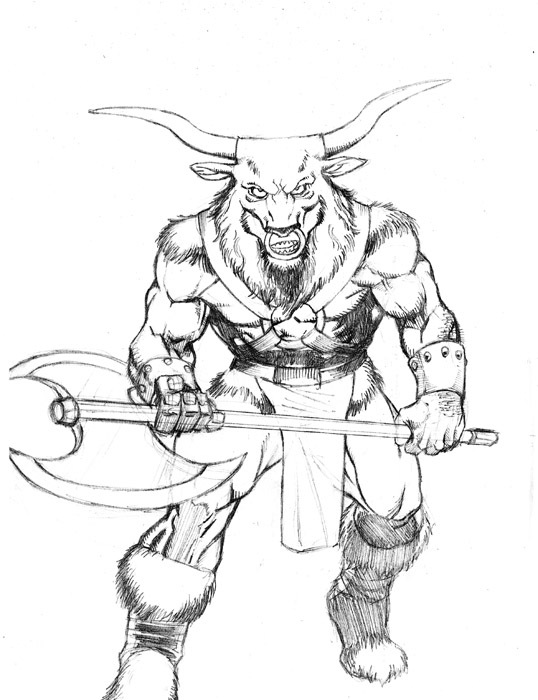 2007-02-24 [Torr-maat]: you should take the crappy d&d pic of a minotaur down. It degrades the names of proper minotaurs everywhere. 2007-04-26 [xido]: lol! Nice... Yeah, I liked them. 2007-09-06 [xido]: lol! Whatever works, right? Well, guess what? That might be a really good thing, since I was just about to post ideas about what creatures would need images, and minotaur is almost number 1 on the list. Get with [Torr-maat] about which ones he needs most of the Minotaur Castes, since they are going to need a racial lineup and some other cool pics if possible. 2008-04-04 [Artsieladie]: This link isn't working. 2008-04-06 [Linn Scarlett]: And on the count of D&D Torr (hope you dont mind me shortening your name, its what I do) but some minotaur are like that, whether the civilized *coughs* like it or not. But eh. We need to get together and work this page into the skies.